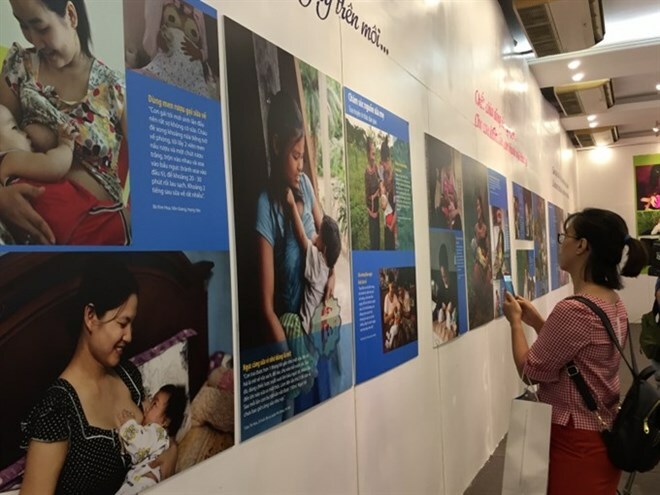 Hanoi (VNA) – Various photos portraying the importance of breastfeeding are on display at the Vietnamese Women’s Museum in Hanoi to celebrate World Breastfeeding Week. With the title ’Breastmilk – Fountain of Love’, the exhibition is a result of projects carried out by the Vietnam Women’s Union in order to support and promote breastfeeding. “Through the photos, we want to send a message that a mother’s milk is a valuable gift given by nature and provides precious nutrition for babies,” said Tran Thi Huong, Vice Chairwoman of the union. The Women’s Union has organised many breastfeeding training courses at industrial zones and remote areas to equip women with breastfeeding knowledge and how to do the milking at work. The exhibition also mentions problems mothers face during the process of raising children, such as postnatal depression.